Howdy! The hubby and I are headed to Napa to celebrate my BFF Rachel's 40th Birthday. 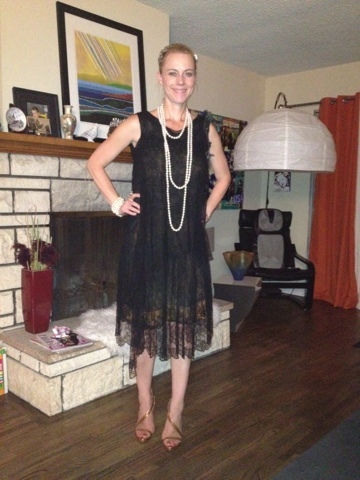 Rachel is having a Great Gatsby-themed dinner party tonight at the uber-chic Carneros Inn. I am biting my nails in anticipation to see what all my fashionable LA friends style themselves in tonight. Especially Rachy! However, I have been bestowed the greatest honor -- pause -- yes, another close gal pal -- who is one sick Renaissance chick --the one and only Lynngweeny, has allowed me to borrow an authentic vintage dress from the 20s. Lynn, a former window designer for all the major department stores -- think Barneys, Saks, Bullocks -- now an interior designer who puts Paige Hemmis from Extreme Make-over Home Edition to shame. Lynn, who knows a little bit about everything fashion, technology and home improvement...among many,many other things...hooked me up. I love that Lynn and her BFF Lolly, another chick who has more creativity in her pinky finger than my whole everything, have taken me on as their styling science project. Lolly, a jewelry-maker and all out creator (I'm not even doing her justice, sorry L), and Lynn have a passion for All Things Vintage. The story about the said dress is hysterical. Lynngweeny and Lolly (they need a sitcom) head to a vintage clothing sale in Santa Monica. Lynn scores the dress which has a few pieces to it. Lolly realizes that Lynn is missing one of the imperative pieces and notices a woman with the missing link. Lynn is almost about to give up when Lolly approaches the chick- who is conveniently hiding the slip portion of the dress under her arm -- and makes it known that they know she is holding out. Lolly acts as enforcer and Lynn walks happily into the sunset with her amazingly authentic 20s dress. This is why I am so over the moon. So, when she said she had a dress for me, I was honored beyond words. When she told me Lolly was in on it and I have some of her gorgeous jewelry to wear, I was so flattered. I will definitely be reporting back on this much anticipated event. Rachel and I have been talking about this special milestone of hers for years. As a former English major, so excited to be celebrating in Gatsby-style. Barneys Warehouse Sale ONLINE only Now!